Launched in April 2012, Trendease Podcasts feature a series of interviews of key industry players sharing their stories with the Trendease Community. From designers and product developers, to retailers, exhibition organizers, and an assortment of market professionals, all having something special to tell our audience, these podcasts promise to shed light on the creative industries. Receive latest Trendease Podcasts via RSS Feed. Get it? Got it? Good! Trendease speaks with Lisa Douet who is leading the 2016/17 trend directions of the Heimtextil Theme Park due to open January 12-15, 2016 in Frankfurt. The themes Protect, Energize, Nourish, and Enrich are meant to achieve a perfect balance in Well-Being 4.0. Lisa explains each direction to communicate textile innovation for hospitality, retail, home, technology, and sustainability. Jirakarn Bejrajati is the Minister Counsellor (Commercial) of the Royal Thai Embassy, London. His team is organizing the ‘Colours of Thailand’ event at Westfield White City on September 18&19, 2015. Well-being and spa products represent a $900 million industry. Over 1000 years of experience, coupled with technology and social responsibility make them strong players in this global trend. Textiles will begin to substitute metals and plastics, says Dr. Klaus Jansen of the Textile Research Council, FKT, umbrella organization over the Central Confederation of the German Textile and Fashion Industry, networker of like-minded trade associations. Smart fabrics and ambient intelligence are the future for home, fashion, healthcare, architecture, and more at Techtextil/Texprocess May 4-7, 2015. 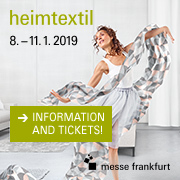 The Heimtextil Trend Forum has changed to the Theme Park and moved to Hall 4.0. Trendease speaks with Anne Marie Commandeur from Stijlinstituut Amsterdam whose firm is the visionary behind the shift. What are the new directions? What is their significance for various markets and how to translate them for diverse applications? Listen now then experience them January 14-17 in Frankfurt. Trendease chats with the founder of Ab Rogers Design, also Director of Interior Design at Royal College of Art, about his projects, which incorporate technology, experiential design, and sustainability. He also discusses his special, more earth-friendly creations focusing on material and color for the May Design Series that listeners are welcome to see May 18-20 at ExCeL London. During the European Digital Textile Conference at Heimtextil Trendease caught up with one of the speakers from NedGraphics to understand more about the implications technology can bring to designing and manufacturing fabrics and floor coverings. Anyone working with weaves should take the time to learn about these advances. Efficient, effective, time and money saving. At Heimtextil 2014 digital printing is a hot topic. Markus Benesch talks with Trendease about where he finds his color inspiration and how he applies it to his collection of digitally printed wallpaper for HP and Curious Boy. Nature is a strong influencer and the lack of color is never missing from his work. See both collections on the Messe Frankfurt fairgrounds in halls 3.1 and 4.2. Caroline Till, co-director of FranklinTill, the consultancy that heads Heimtextil’s Trend Table for the 2014/15 trends, gives an exclusive interview to Trendease talking about the design directions of the future and what to expect when visiting the Trend Forum at Messe Frankfurt next January. Science and technology meet a celebration of heritage and rediscovery in interior design as well as textiles. Director of Marketing for the Visa Luxury Design Hotel Collection, Brooke Van Hatten, speaks with us about the company's relation to design and on being the headline sponsor for this year's designjunction. The Visa Luxury Design Hotel Collection has put together a hotel program for its premium card holders, featuring a selection of 900 curated design-centric hotels around the world. Neil Davis is the man behind tokyobikes in London. Tokyobike is a partner to designjunction and in addition to exhibiting, the company also organizes daily bike tours to visit design hotspots around the city. Hear what makes these bikes design icons, as well as how they are positioned among some of the world's top design brands. Missed them at designjunction? Stop by the shop in Shoreditch. The affable Steve Jones of Innermost talks about their London Design Festival and explains the three new product launches they have unveiled for the event: canvas chair, dent lighting, and poke stool. Creating illusions and playing with materials is their hallmark and catches the attention of visitors. Steve points out, that "it is always good to have a smile creator on the stand." A design event has taken the London Design Festival by storm. Deborah Spencer, show director of Designjunction, gives us a flavor of the show's concept, mentions highlights from the 2013 London event, and tells us what's in the pipeline for the future. One hundred fifty brands gather together at the old sorting office on New Oxford Street to show off their wares to an international audience. Angela Boswell speaks with us about how a visit to Surtex this May 19-21 plays into her team’s product development cycle at Ellery Homestyles, a bedding, window, and throw supplier to major retailers like Bed, Bath & Beyond, J.C. Penney, and Amazon.com. From classic brands such as Waverly to innovative brands like Arm & Hammer, what trends are on the horizon? Hear what Lauren Sizeland, Director of Business Development & Licensing at the V&A Museum, has to say about working with one of the world’s largest collections of decorative arts and design. How does she find a proper home for licensing the museum’s works? Learn about the huge success of the David Bowie exhibit and how it is forecast to take the globe by storm! Duncan Riches, who guided people on the tokyobike tour in Milan during design week in collaboration with designjunction, takes us on a special "tour" of his favorite finds at Edit. Learn about manufacturers returning to their archives to tweak items from the past with new materials and/or production processes, understand how designers are gauging interest, and find irony in a lady’s touch. Michael Sodeau, creative director of designjunction, talks with Trendease about past and future events at the former mail sorting office during the London Design Festival, as well as the upcoming exhibition, Edit, taking place in the trendy Brera Design District during Milan Design Week, April 9-14. Jump on your tokyobike, down a shot of espresso, and take in the latest contemporary designs. Rory Dodd explains the intriguing project Designersblock is about to launch at Interiors UK January 20-23. Together with a slew of international designers, they will set up Designersblock & Co., a department store complete with a haberdashery shop and perfumery—and of course a bar—right in the middle of the NEC Birmingham. Visitors can uncover a range of home fashion at the event. Dids Macdonald, CEO of ACID, talks about judging for the New Design Britain Award. Finalists in the categories of furniture, furnishing accessories, surface coverings, and fabrics will unveil their goods at Interiors UK in Birmingham January 20-23. 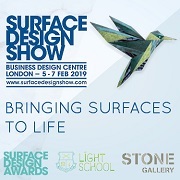 Hear what Dids has to say about the opportunities this prestigious award brings, along with her expert advice on exhibiting and working with suppliers. Enjoy this exclusive interview with Jennifer Castoldi and Karim Rashid on the HP booth at Heimtextil. Design has no boundaries as it moves from an analog to a digital universe. The new world is one of immediacy; how does this play into disposable design with the growing importance of sustainability? This international design super star is embracing the new roll of technology and loving it. Trendease catches up with Chris Verbeek of Verbeek Designs at Dutch Design Week in his studio where he mentions a visit from IKEA, discusses cross-cultural market differences, forecasts colorful design directions, and more. Chris and his team design surface patterns for a variety of interior products. It is imperative for them to always have their fingers on the pulse of innovation and creativity. 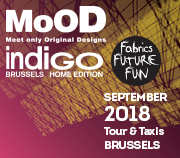 Innovation is a central theme for MoOD Brussels. This year the exhibition expanded its Innovation Platform to be twice the size and it held a half-day seminar titled "For the Love of Innovation". Niek De Prest speaks with us, highlighting points from the event. Novelties are essential to sustain the planet and business. Samples from the Innovation Platform are free to view on MoODBrussels.com. In this podcast Niek De Prest, trend coach to MoOD, speaks with us about the themes that fall under the 2013/14 trend Fluxus: Eccentrics, Prorsum, and Transition. In times of change there are different directions for various consumer groups. Learn about three of them here and discover the corresponding color palettes. Trendease.com will publish full visual coverage hot off of the exhibition floor.